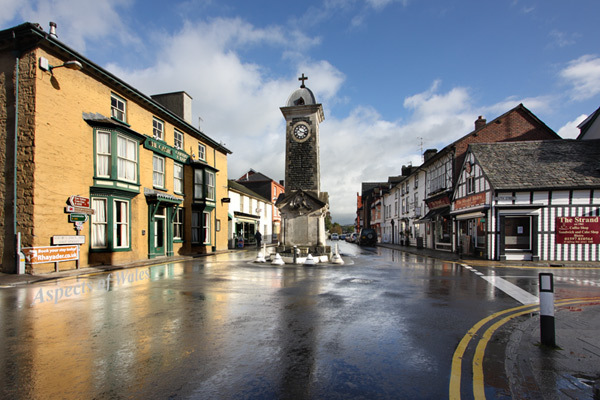 Taken at 10.20am (assuming that the clock in the tower was correct) after a heavy shower on 29th October 2013, at NGR SN9709867994. This normally busy crossroads is on the A470, linking North and South Wales. It is also the gateway to the beautiful Elan Valley, to the west. Rhayader is a market town on the River Wye; its name is a corruption of the Welsh "Rhaeadr Gwy", meaning waterfall on the Wye. The River Elan joins the Wye approx 5 km downstream of Rhayader. The clock tower was built in the 1920s and is now a war memorial for both world wars. Canon EOS 40D, Canon EF-S 10-22mm lens at 10mm, hand-held. Exposures F11 at 1/25, 1/50, 1/100 combined. Original image in Raw format.